Members who visited SAAR’s Facebook pages this past week, likely saw and took the series of five mini quizzes testing knowledge of Scottsdale sign ordinances. Well, the results are in and … well … a refreshing glance at the local ordinances is a good suggestion. If you missed taking any of these quizzes, take a look at the following five questions and see how your answers stack up against the answers shared below. Q2: Does the current Scottsdale sign ordinance allow for the proper display of portable directional signs in the right of-way or sidewalks? Q3: Does the current Scottsdale sign ordinance allow for flags or balloons to be attached to temporary or portable signs? 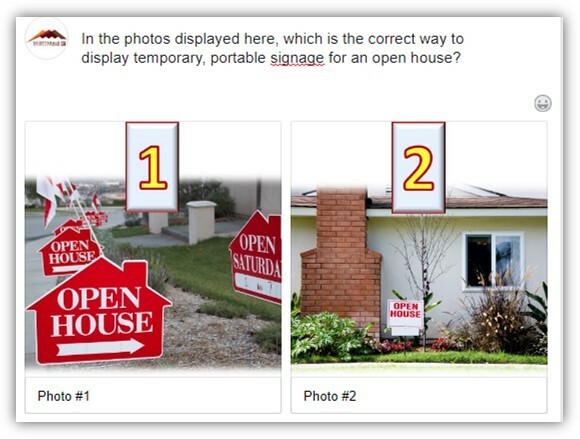 Q4: Which is the maximum allowable time frame for an open house sign to be displayed in Scottsdale? A) 7 a.m. – 8 p.m.
B) 8 a.m. – 5 p.m.
Q5: In the city of Scottsdale, does the current sign ordinance for temporary signs (real estate signs) allow the elements of illumination, animation, or amplified sound/speakers? Answers: Q1: #2. Q2: No. Q3: No. Q4: Answer A. Q5: No. Need that refresher? Visit the Scottsdale section on the sign ordinance page. Be sure to bookmark it for easy reference.